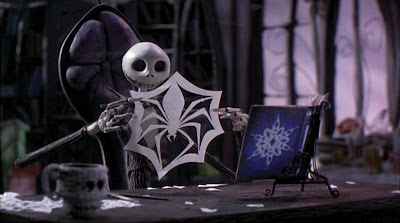 Remember Jack Skellington's spider snowflakes from Nightmare Before Christmas (seen above)? Well, now you can make your very own spider snowflakes courtesy of some simple instructions from Instructables.com! They even provide a template! All you need to make the spider snowflake is some paper and scissors (and a printer to print the template out). You could even try using different colored paper if you are looking for something a bit more bold. If you make multiple ones, you can string them together and create a spooky spider snowflake garland! For the template and instructions, visit the Instructables' article! Thanks for sharing this! Always exciting to get a new Creepmas craft! Thanks for this! I am always looking for inexpensive ways to decorate, these are perfect. Going over to Instructables to take a look. I made one for my office decoration, everybody loves it. Since I posted a picture of the one I made on my blog, I credited you as the source of my inspiration.